The North American musical Come From Away, currently on the Abbey stage, is another attractive show to be seen over the Christmas period. The puzzle is why a production created outside Ireland and on its way to London’s West End is playing for seven weeks at the Irish National Theatre. 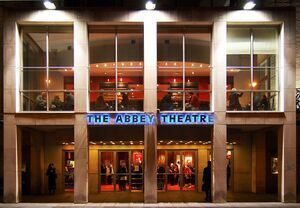 The Abbey receives by far the greatest share of the Arts Council theatre budget, and the assumption must be that this subvention is an investment in the vast creative talent within the Irish theatre community. Is it appropriate that there should be no representation of Irish-based writers, directors, actors and designers on the main Abbey stage for two months of the year for which it receives generous public funding? Some 140 Abbey staff are listed in the Come From Away programme and they are among the most experienced and committed practitioners of theatre in Ireland. Many freelancers on the Irish theatre scene are available for their expertise also to be engaged. Surely it is the responsibility of our National Theatre to draw on this well of home-based talent, recognised and envied outside our shores, to produce its own show for Christmas. Posted in Misc and tagged Abbey Theatre, Irish Times letters page at 2:54 pm on December 13, 2018 by Bodger. At first glance the Peacock has 2 Irish shows during December. I hear Michael Colgan is at a loose end. He’s pretty good at putting on Irish shows. Seriously though, part of the remit of the abbey is to put on the best of international work as well as domestic work. The reason why is because the show is enroute to the West End, giving Irish fans have a chance to see it without travelling to New York and London. Quite a coup to get it I would have thought. What an awful grumble about nothing. 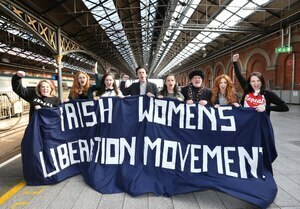 The Abbey does not get funding to co produce musicals to try out before heading to London, we have the gaiety for that. Far from being a coup it’s shot itself in the foot. The fact that no home grown talent will get to earn a wage this Christmas is appalling and shameful. The unemployed theatre practitioners of Ireland wish you all a very merry Christmas! This is a show for the bord Gais or Gaiety theatres. It is completely against the Abbeys remit to use tax payers money to fund a commercial West End warm up. The Abbey is not a receiving house, it should be presenting its own work and nurturing Irish talent – not exclusively- but primarily. That’s what it’s grant is for. So the taxpayer’s money is to fund the writers and actors only? Not to support those that actually pay to see these shows? Yes, it’s also particularly for the audiences Cian. As a break from the populist crap that theatre should be kicking against right now and not embracing. The Abbey is expected and encouraged by their State funders to tour Irish productions internationally but you critisise them when they reciprocate and host international productions at the Abbey. Come on!!!! Who cares? The cossetted Irish Arts sector has been milking it for years with mediocrity. If the Abbey closed who would miss it?